During the early part of December 2018, I decided to start an experiment to see how the weather models would perform forecasting the weather up to 6 days ahead. To get things started I choose a location near me that being Stornoway on the West coast of Scotland there is a Met Office weather station situated there and I wanted to use a Met Office weather station since it would record accurate weather observations during this experiment and there is also another weather station close by at the airport I would use this as a back up in case the one from the Met Office failed to report any readings during the experiment. I plan on doing more of these once the new GFS model is out and the next time I will be using multiple locations across the whole of the UK instead of one location in order to get more accurate results. Please do not take the results from this experiment too seriously as it was just for me to see which weather forecast was the best for my local area and I've decided to share the results here with you all. GFS (Global Forecast System) run by the United States' National Weather Service. ECM (European Centre for Medium-Range Weather Forecasts). UKMO The UK's Met Office. ICON (ICOsahedral Nonhydrostatic general circulation model) from the German Weather Service. GEM or as it's sometimes called the CMC is from the Environment and Climate Change Canada weather model. FMI Hirlam Model from the Finnish Meteorological Institute. HIRLAM or sometimes called KNMI is from the Netherlands Weather Service. BBC Weather I decided to include it since they use data from the MeteoGroup I'm not sure what weather model they use it could be the ECM or a combination of several weather models. Weather Underground They have the largest weather station community in the world which helps them produce their own forecasts. DarkSky An award-winning weather app. The Weather Channel Which Google use for their weather forecasts. Every day over the following weeks I would take notes on what every forecast said from all of the weather models 12z runs and when the time and day came I would check the observation made at the weather station and take a note on how far off their predictions were. Then all of the results were averaged out with a months worth of data to find the mean error from each of the forecasts. 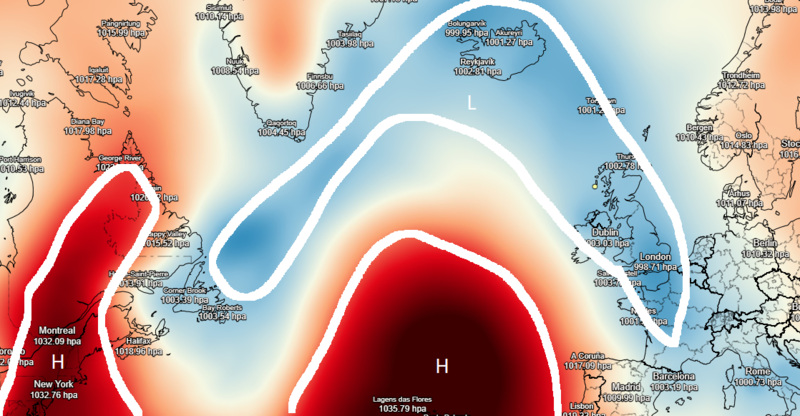 Notes: The GFS was a bit of a surprise with it being down in 10th place it was slightly more bias towards having the temperatures warmer than forecast the same goes to FMI and HIRLAM which also both struggled when it came to predicting colder weather and overnight temperatures. Notes: You may notice some of the weather models and have disappeared this is because not all of them go this far out. Notes: This is as far as the ICON 7km data goes and it still remains in first place it's done really well with 3rd place at day 1 but leading all the way from day 2 to day 5 it's the clear winner when it comes to forecasting temperatures at short range. Notes: The ICON seem's to be in a different league when it comes to predicting the air temperatures I've looked through the data and it shows just how incredibly consistent it was. I thought it would also be worth showing how each weather model performed at predicting temperatures during the day and at night. 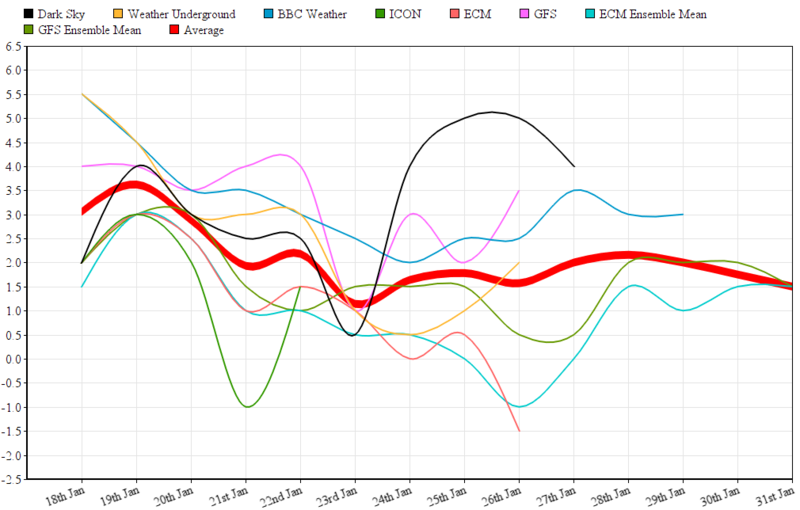 Notes: Almost all of the weather models performed more poorly at nighttime compared to the daytime and it's interesting to see how the ECM and BBC Weather done well during the day but are both the worst when it comes to predicting nighttime temperatures. Notes: The ECM underestimated the wind speeds for the whole experiment. In my experience, I've seen it do the same thing for some other locations and when I redo this experiment using multiple locations it will be interesting to see if the ECM still underperforms when it comes to wind speeds. Notes: A few of the weather models seemed to handle the wind speeds poorly those being the HIRLAM, ARPEGE, FMI and the AccuWeather all of them tended to overestimate the wind speeds especially the ARPEGE weather model while the AccuWeather seemed to suffer from the same issue as the likes of the ECM and underestimated the wind speed. Notes: The GFS has made a big jump back down to last place as many will know the GFS likes to overdo wind speeds while it seems to manage them well within the 1 to 3-day range it seems beyond that it tends to overestimate them more than other weather models. Notes: GEM seemed to really struggle around this point. While the ECM may have been behind the GFS it has done a better job with the wind speeds at day 5 and 6 compared to the GFS. Notes: It's surprising to see the GFS so far down the list. As for the HIRLAM and FMI, they both proved to be very inconsistent even at just 24 hours. Notes: ARPEGE which came 5th for both day 1 and 2 now falls to the last place it seems to become more unreliable from day 3 onwards. Notes: This may surprise some people but once we got to day 5 DarkSky didn't seem to struggle as much as any other weather model. Notes: ICON and DarkSky were the top 2 best are predicting air pressure the Met Office and the ECM were not too far behind. Both the GFS and BBC Weather were the worst. Notes: The overall winner from this experiment is the UK Met Office it performed as the most consistent weather model with the least number of mistakes between temperature, wind speed and air pressure between 1 and 6 days over the period of 1 month. As to why the ECM, GFS and GEM are behind? This is because it seems the likes of the BBC Weather, DarkSky and the Weather Underground use more than weather model I explain a bit more in the summaries below and I believe this gives them a slight edge over some of the weather models. GFS: Its one of the worst overall when it came to air temperatures it always had a slight bias towards warmer temperatures and the few cold nights that occurred during December the GFS failed miserably at predicting them even at just 12 hours before the GFS was up to 4°C on a few occasions off the actual recorded temperature. The only strong point that came from it was predicting wind speeds better than any other weather model at 24 hours ahead. The GFS was also one of the worst overall at air pressure this has been known for a number of years now with most low-pressure systems it likes to overdo them which was evident several times during this experiment. In the end it finishes in 7th place just ahead of the GEM model it may come to no real surprise to some people how badly the GFS performed overall and I can only hope that the new upgrade brings it better results. ECM: It was a little bit of a disappointment for me it's still my own personal favourite though. 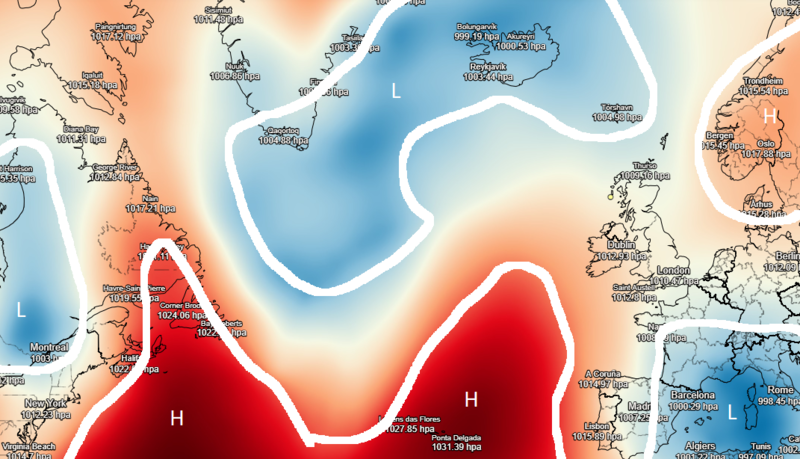 It was one of the best at forecasting temperatures and performed remarkably well with the daytime temperatures but appeared to really struggle with nighttime temperatures. It came 2nd last with the mean wind speeds but actually did a decent job when it came to predicting the wind gusts. The ECM showed it was one of the best at air pressure between day 1 and 4 but fell back a lot for day 5 and 6. Overall it finishes 6th out of 8th that will mainly be because of the wind speeds letting it down it did, however, it did do better than the GFS and GEM. I know the ECM vs GFS happens a lot at the moment the ECM is the overall better one but the gap between how well they perform is actually pretty small which would maybe explain why sometimes one of them does a better job than the other but then this is just all based off this one experiment so it's important not to read too much into it. UK Met Office: It did great with air temperatures both day and night. It came 2nd overall for the wind speeds and 3rd place for the air pressure and it was the overall winner. ICON: It was the best and by some margin for predicting air temperatures and also being the best for day & night time. It wasn't just the air temperatures it was the best at up to 120 hours with the air pressure as well. Coming 2nd overall I think may be a surprise to some people I really didn't expect it to do so well and does seem to be a weather model worth checking. GEM: One of the worst for temperatures although it did an okay job at night time temperatures. For wind speeds, it tended to overestimate them and was actually one of the worst overall for it. It wasn't the worst nor the best for air pressure and by the looks of it, the only thing GEM was a bit decent at. FMI: One of the worst performing weather models of the whole experiment it failed to do well in anything I can't really say anything positive about it. ARPEGE: It didn't do too well with the air temperatures or mean wind speeds but actually was one of the best with the air pressure especially up to 2 days ahead and it was the overall best at predicting the wind gusts. HIRLAM: Very similar to the FMI weather model it was just very inconsistent with everything. BBC Weather: I'm not sure what weather model they use it's very likely to be the ECM but the results from the experiment differ a bit the ECM was better at the temperatures and air pressure while the BBC Weather was the overall best with the mean wind speeds while the ECM was one of the worst which makes me think the BBC Weather use not only the ECM but also perhaps some other weather models as MeteoGroup say on their website "With over 100 meteorologists, a department dedicated to research and development and investment in the five weather models recognised as being the most accurate in the world: ECMWF, UKMO, GFS, HIRLAM and WRF, we are able to provide the most precise forecasts in the market." Might suggest they use more than just the ECM. In the end, I think the BBC Weather may have surprised some people coming 4th out of 8th overall. Weather Underground: With the weather models now out of the way it's time to start with the weather websites and apps something I added into this experiment out of interest to see how good they would be compared to the weather models I really didn't have much hope for them but they certainly did much better than I expected with the Weather Underground coming 3rd overall is pretty amazing. A bit more about how their forecasts work "Our ever-expanding network of 250,000+ personal weather stations is the largest of its kind and provides us with a unique ability to provide the most local forecasts based on actual weather data points. BestForecast™ uses the most innovative forecast models available and cross-verifies their output with all of the localized data points. Only our unrivaled amount of local neighborhood weather data can generate forecasts for your front door." Also uses different weather models "A variety of inputs, including, but not limited to, ECMWF, GFS, and NAM"
DarkSky: Just like the Weather Underground it performed much better than I expected coming in 5th place. It done a great job at predicting the nighttime temperatures and was one of the best when it came to air pressure especially at day 5 and 6 where it was the overall best but I couldn't understand how a website/app could so so well so I did a bit of research and found this in an article from a few years ago it seems DarkSky uses a few weather models like the GFS, GEM and ICON, “We first correct for geographically related bias in each model individually (e.g., GFS temperature seems to be annoyingly low in some places, higher in others). And then we monitor the accuracy of each model, geographically, to calculate a standard error which we use to weight each model on-the-fly whenever a request comes in for a forecast." The Weather Channel: It did a decent enough job in its short range 2-day forecasts with temperatures and wind speeds it wasn't the best or the worst and did actually do better than some of the weather models. However, The Weather Channel uses the API data from the Weather Underground so they basically say the same thing it's just that The Weather Channel runs behind and updates later so your best just visiting Weather Underground itself to get the very latest forecast. Accuweather: Seems good enough for temperatures doing a fairly decent job but was bad for underpredicting the wind speeds. I think it went fairly well all of the weather models were presented with a difficult challenge of forecasting the weather for just one very localised location. It threw up a few surprises with some of the weather websites/apps doing a better job than some of the weather models although it looks like we now know why that is. As I said at the start it's important not to take these results too seriously as they are just based on one location over a time period of a month and just looked at temperatures, wind speeds and air pressure. Once the new GFS model is out a new experiment will take place which will include more locations across the UK and I will try to add more weather models and websites/apps to it and I will try to include more things, for example, rainfall and cloud cover. I hope you enjoyed reading this rather long post but found it as enjoyable and fun as I did doing this thank you for reading. A really interesting and informative tranche of research. Thank you. Look forward to tranche 2. I'mactually starting a project at work using the Dark Sky API to get forecast data for multiple sites, good to see its verification stats are more than reasonable. Thank's I'm glad you both found it interesting. It's good to have a better idea on how well each weather model does now and what ones to look at and ignore. I think people may need to pay more attention to the forecasts from Weather Underground and DarkSky because they both done really well. Looks like it's a bit of a flat pattern it's going for.